I've determined that I need a 68"-70" bow, but I'm having trouble finding a good selection of inexpensive starter recurve bows in that length. I'm not looking for a heavy draw since I won't be shooting from long distances nor at any animals. Do you have any suggestions? I also need help in selecting an arrow and tip. I only plan to shoot in private at targets. When I buy my bow, assuming it includes nothing but the bow and string, what else should I buy? 32 year old male with a 73" wingspan. The coach's answer is exactly what I need. I'm a 77 inches bow and looking for an American traditional bow. Thank you for using Learn-archery.com for you archery needs. We will be adding more information as time permits. Tim's question/problem was exactly the same as mine. Your answer was very helpful and cleared up many concerns with regards to whats available on the market for traditional bows. 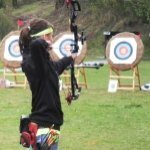 Learn-Archery.com has been an excellent source of information for all things archery related. I will be recommending it to anyone interested in archery. I'm looking for a take down recurve bow. Thanks to your comment I now know that I need a 60" bow. I really appreciate your advice. Without knowing the specific type of bow your interested it is difficult to make suggestions. Each style has its limitations as it relates to size and availability. Note that the bow size information on Learn-Archery.com is focused on modern ILF (International Limb Fixture) recurve bows (sometimes referred to as Olympic Recurve Bows) and compound bows. Also note that if you’re selecting Traditional, Traditional Take-Down or Longbows you are going to end up with a bow that is shorter than what we list on our bow size page. Here is a short list of the popular traditional bow sizes available on the market today with suggestions for draw length. The suggested size for a specific draw length is just a suggestion – there are no hard and fast rules. 1. A short bow with a shorter brace height is going to have a sharp/crisp feel to it. The arrow speed is likely to be faster but the drawback is typically that minor errors in shooting form will show up in the flight of the arrow. 2. A longer bow with a longer brace height is going to typically have less shock and vibration and usually more forgiving when it comes to minor flaws in shooting form. The drawback is that you typically sacrifice a little arrow speed. 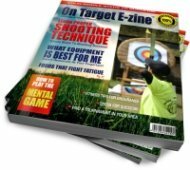 A beginner or novice is probably better off shooting a more forgiving bow while they learn proper shooting form and technique. Keep the draw weight low on your first bow so you can practice longer without fatigue or injury. Remember - The purpose is to have fun while you learn to master your technique. If your bow is uncomfortable because it is an aggressive shooter then the fun factor will rapidly diminish. Bottom line – Don’t make your first bow choice "the one you plan to keep and shoot forever". Pick something that is relative to your short term goals for the first 6 months to a year then upgrade later when you have a better feel for what you really like and your skill level.